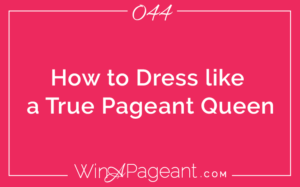 In today’s episode, we’re discussing how to dress like a true pageant queen. It’s simple, but not so easy. It comes down to what you have in your closet. And if you’re listening, you need to update your closet. Yes, you. I’m talking to you – the woman who’s had the same hair-do for like 7 years and you’re still wearing your favorite shirt from college, and you wish they still made those shoes you always love. And, I’m also talking to me, because it’s high-time I get a new ‘favorite shirt’ so I don’t end up in People Magazine with a side-by-side photo in the same shirt – one dated 2009 and the other 2016. If that’s you, it’s time for an upgrade. As you grow (up, old, into yourself), you have new priorities, responsibilities, and personality! Whether you like it or not, you’re judged by your appearance and every woman knows that what you wear has a lot to do with how you feel. If you are still holding onto things that no longer represent the new you (or the best you), then you are doing yourself a disservice, and others will know it too. After every pageant, the women that lose always have the same reasons for why they didn’t win. In this episode, I break down the actual reasons women lose pageants (it’s 1 of 3 or some combination of them). Plus, I teach you how you can avoid these so you can win. 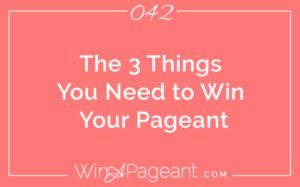 Every pageant winner has these 3 specific things. In this episode, I’ll teach you what they are and how to get ‘em! 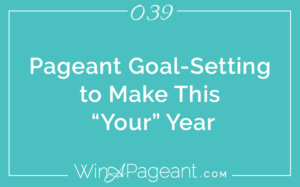 In this episode, I break down the zillions of benefits you’ll gain from competing in a pageant. They fit into these 5 categories: Social, Professional, Personal, Financial, Health. This is a great episode to help explain to someone (you mom, your boss, your boyfriend, yourself) how competing in a pageant can help you succeed in life! This episode gives you a breakdown of what makes a pageant a pageant. I discuss some of the lingo of pageantry so you know the difference between systems, divisions and other confusing pageant lingo. Plus, I share with you some pageant history that is great for trivia games and the off-the-wall pageant interview questions. Several years ago, a mentor of mine explained the concept of “The Year Scot.” In case you were wondering, his name was Scot.